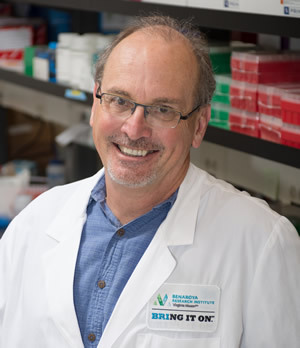 Peter Linsley, PhD, Director of Systems Immunology at Benaroya Research Institute at Virginia Mason (BRI), is a trailblazer in the field of immune response regulation. On December 10, 2018, the Nobel Prize in Physiology of Medicine was awarded to two immunology researchers, James Allison, PhD, and Tasuku Honjo, PhD, for their work related to immune checkpoint inhibitors which led to the development of cancer immunotherapy. BRI celebrates Dr. Linsley’s contributions to the understanding of the regulation of T cell activation. His identification of B7 (now CD80) as a co-stimulator of T cell activation and CTLA-4 as another T-cell activation signal, contributed significantly to the body of knowledge about immune system regulation that ultimately led Drs. Allison and Honjo to their discovery of new cancer therapy approaches related to immune regulation. In the late 1980s, Dr. Linsley was working at Oncogen (later bought by Bristol-Meyers Squibb) where he was conducting research on a project to identify a ligand for CD28, with the hypothesis that that molecule might trigger T cell activation. He found the B7 molecule, showed that it was expressed on activated B cells, bound CD28, and co-stimulated T cell activation. Linsley went on to investigate the newly cloned molecule CLTA-4, which had a similar structure to CD28. He found that CTLA-4 also bound B7 and that it bound B7 more strongly than CD28. The discovery of these interactions between B cell bound B7 and T cell molecules CD28 and CTLA-4 helped demonstrate that interactions between B and T cells were involved in immune response regulation. Dr. Linsley continued investigating CTLA-4 as a potential immunosuppressant and went on to develop the drug Orencia, which is composed of a portion of the CTLA-4 protein that binds B7 and blocks T cell activation. Orencia was approved for use in rheumatoid arthritis by the FDA in 2005 and for use in active psoriatic arthritis in 2017. While Dr. Linsley’s work continued on to investigate how he could use these T cell activation checkpoint molecules to turn off the overactive immune response in the case of autoimmune disease, Drs. Allison and Honjo continued their laboratory investigations with a different goal in mind, how to use these molecules to turn on an immune response against cancer cells. BRI congratulates Drs. Allison and Honjo on their significant contributions to development of cancer immunotherapies and their Nobel Prize and celebrates Dr. Linsley’s contributions to this field of research.